Start Small craft: It’s craftsanity! Oh, the messes I make when given glue and paint. Oh, man it is going to be one of those weeks. But since I relish a challenge, I am ready. I am having computer problems and ran out of batteries for my camera. So until the technology in my life chooses to cooperate, I will be posting from work during my breaks. So I may be behind my usual posting times, but I will get there…eventually! I actually have 2 Start Small crafts on tap this week. A few weeks ago, my mom made my baby a new dress for summer. However, the area she lives in is craft supply deprived and couldn’t find buttons that worked with the dress. So she mailed me the dress and I get to find and add buttons. For my other project, I need to make a gift for a 3-year-olds birthday party. I can’t tell you what it is because I don’t know what it is. But you’re all going to have some pretty cute stuff to look at come Friday. 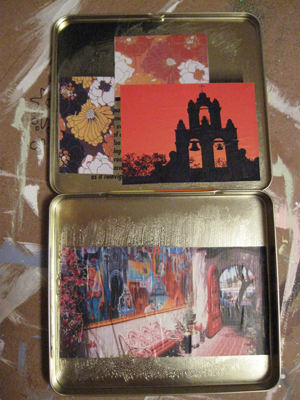 The inside of the tin for Cousin S.
As for today, I have what I am called a Start Small supplement. It feels really, really wrong to even consider not adding pictures to my post. So I will share pictures from a past small craft I did so you guys have something to chew on. One of my much younger cousins is very, very into art. Naturally, that makes me pretty happy. So I decided to equip him with a sweet decoupaged tin to house supplies in. I also have two other cousins who are the same age, so I made one for each of them as well. I bought the tins during my honeymoon in Deadwood. They are actually tins from those crazy flavored cigarettes or mini cigars. The patterns on them were way to fun to pass up, especially at a buck each. So I snagged a few. For each tin, I just added a few quick images. I didn’t want to totally cover the design, but I had to cover anything illicit. I didn’t want my cousins getting busted for smoking…in grade school. 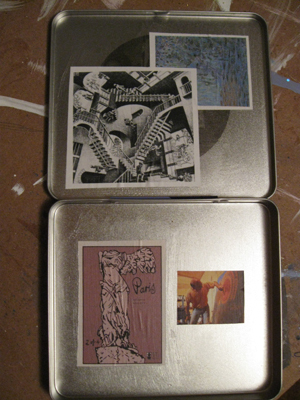 Inside of tin for Cousin A. The outsides of all the tins are at the top of the post. 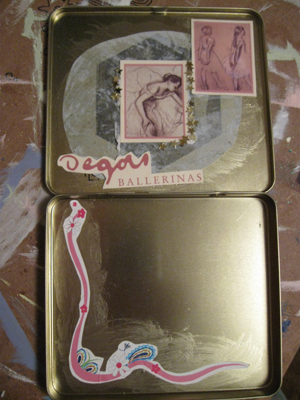 The top left tin belongs to Cousin S. I did a fun, girly theme with Degas ballerinas and floral swirls inside. The top right was for Cousin A., also a girl. But I didn’t think girly-swirly fit her. So I went for a bright orange theme with pictures of Spain inside. Why Spain? Just because it looks soooo pretty. The bottom tin was for Cousin C., the guy who got me started on this. Since he’s the art lover, I put “mad for” on the front and filled the inside with art. Monet, Escher, and a few other pieces. So this really was a super simple project. If you have any containers lying around – coffee cans, jewelry boxes, even Pringles cans – just get some Mod Podge and go to town. It’s a really fun way to kill some time. 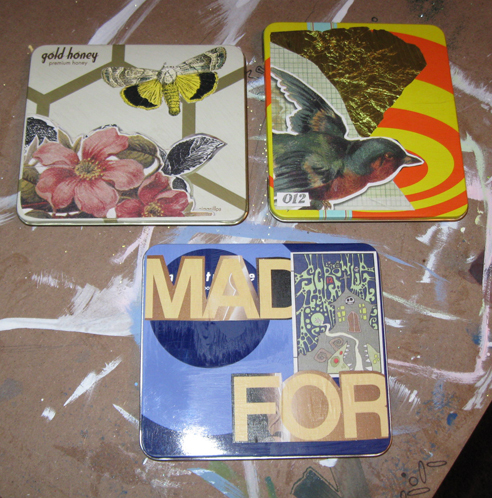 Plus, people get really excited when you use a decoupaged box as gift wrap. Hopefully that will be enough to get you all inspired for the week. I will see you guys Wednesday!